Well I have to say Andrew and Chelsey’s wedding was a magical day and as the groom’s sister, Maid of Honour and of course wedding stationery designer I can confirm everyone had a wonderful time! The whole day went without a hitch, even our 18month old little boy Sam didn’t seem to distract, with his shouts of ‘hiya’ from the front row! Andrew and Chelsey live over in Canada and chose to get married back in Yorkshire where we grew up. So due to the distance and the time difference, all the planning had to be mostly done over email, which worked surprisingly well. Chelsey wanted to achieve a rustic vintage countryside look to their wedding stationery and overall theme. The colour palette for the day was a lovely combination of peacock blue, sunshine yellow and turquoise. 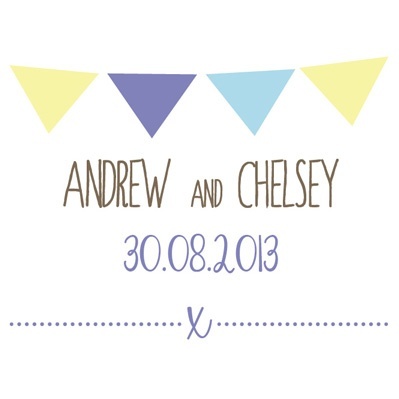 The design was beautifully simple with illustrated bunting complemented with a hand drawn typeface. Their wedding invitations were a set of three stepped cards consisting of the main wedding invitation which was the largest at A6, then a guest additional information card and rsvp, with a lovely peacock blue post back envelope. All elements were printed on a recycled paper stock called Ellie Poo – that’s right, it is made from ‘you know what’! The wedding invitation sets were hand finished with a length of cotton lace, tied with a twine bow to add that bit of rustic charm. 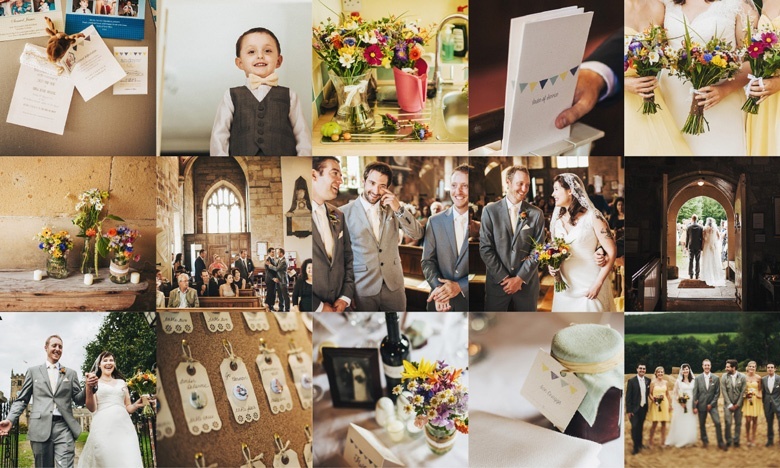 For the church service Love Invited produced an 8 page A5 Order of Service which continued the rustic vintage theme. Chelsey’s attention to detail was amazing, The Stone Trough Inn, where the reception was held, was decorated with Chelsey’s hand made fabric bunting which perfectly complemented the little guest place tags made for the miniature jars of strawberry jam, homemade by our Gran and the tent card table numbers. Click to contact me about your bespoke order and to see a few more photos. Next post: A night at the museum two!